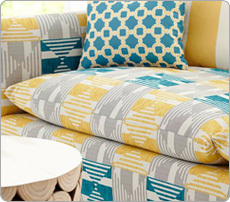 What's the difference between scatter and bolster cushions? 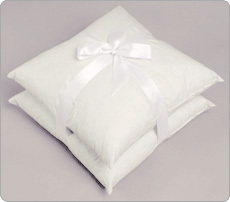 Scatter cushions are for decorative proposes and for aiding in support and comfort when necessary. They can be made to any shape or size and come in a wide variety of loose fillings including natural and synthetic options. We have a range of ready made designer scatter cushions and also supply various shapes and sized cushion pads in our online shop. If you are looking for something different, please use our bespoke service or contact us and we will be more than happy to help you with your request and supply you with a scatter cushion tailor made to your own specification whether its a cover, inner or both. 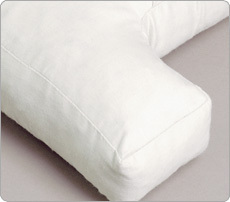 Bolster cushions are cylinder shaped and can be used as a pillow for extra support and comfort or as a scatter cushion purely for decoration purposes. 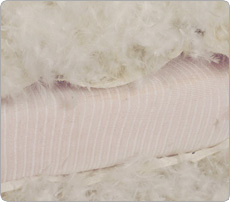 Bolster cushions are available in the following fillings duck feathers, fibre and feather/down, as these are best suited to this type of cushion. For more information on these fillings please visit our fillings guide. We have Bolster cushions in many sizes in our online shop. If you require a different size, please contact us and we will be more than happy to help you with your request and supply you with a bolster cushion made to your own specification. So what exactly is a wrap cushion? 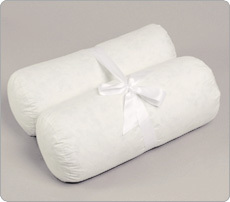 A wrap cushion is when the cushion inner is made using both a foam block and a loose filling in combination. A special cambric inner is made with two chambers, an inner chamber and an outer chamber. The inner chamber is for a foam block which gives the cushion a stable core that will provide support and the foundation of the inner. The outer chamber is then filled with a loose filling that surounds the foam core both top and bottom, this softens the appearance of the foam and changes the feel of the cushion to mimic that of the loose filling, while having a firmer core means the cushion has increased support and durability. A wrap cushion provides the best of the foam and the loose filling in combination and will last longer than a pure loose filling inner and require fare less maintenance over its life, like plumping and turning which makes it one of the most desired inners for seat and back cushions. What's the difference in construction between knife edge and boxed edge cushions? A boxed cushion is constructed with a top and bottom panel and a border (i.e. sidewall) around the edge. The border gives the cushion a boxed appearance and is key in determining the cushions depth. The cushion can be made in any shape or size and there are no restrictions on the cushions border size (i.e. depth) and we are always happy to help recommend a depth if you are unsure. Boxed cushions can also be made with any filling including all loose natural and synthetic options and any foam density required can be chosen. 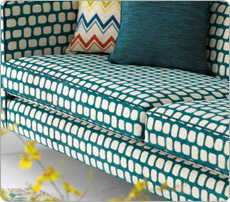 Most popular as seat and back cushions but can also be used for scatter cushions when more support is required or just a unique look. Knife edge cushions are constructed with just a top and bottom panel and have no border, they only get there depth from how much filling they are stuffed with so you can not choose an exact depth, only an approximate. This gives them the appearance of being domed in the centre and thinning like a knife edge to the side. 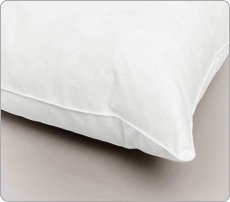 A good example of this style of cushion is a pillow that you use to rest your head on whilst sleeping. This style of cushion is extremely popular for use with scatter cushions, but is also becoming a modern design choice for seat and back cushions as it is thought to have a less formal and more relaxed appearance. Only loose fillings are available with this style of cushion as foam block are not suitable for this use. What's does the finished boxed and knife edge cushions look like? Here is an example of a boxed edge seat cushion on a sofa were you can clearly see the border between the top and bottom panels. The border enables the cushion to have a more precise depth and transforms the cushion into a 3 dimensional object. A boxed cushion is the most popular style of cushion when it comes to furniture as it offers stability and support as a seat or back cushion. If designing a cover you may choose to have the border in a different fabric or add piping detail around the edge of the panels. This style of cushion can be use in any of our bespoke services and in conjunction with any filling your require. In the example of the knife edge cushion you will see that there is no border between the top and bottom panels but the cushion still has a depth. The filling inside the cushion has created a depth by (push out) i.e. pushing the two panels apart. The cushion inners remains plump in the centre and thin to the edge of the cushion, this is achieved by having channels running through the inner to hold the filling in place so the cushion maintains its depth while used. This style of cushion is becoming increasingly popular in furniture for seats and backs in sofa, chair and bench cushions as it creates a relaxed modern looking cushion.